Ideal for use as radiator cover grilles, cabinet and door panel inserts, custom ventilation, room divider inserts and for general interior screening. Decorative Screening Panels in Unfinished MDF ready for painting in the colour of your choice. 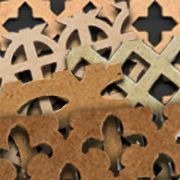 These decorative mdf grilles are ideal for screens in radiator covers, cabinet and door inserts, custom ventilation and general interior screening. Sheet Size: 1830mm x 610mm (approx. 6ft by 2ft). These decorative panels are ideal as radiator grilles in radiator cabinets, cabinet and door inserts, custom ventilation and general interior screening uses. Oak Veneered MDF Decorative Screening Panels. These decorative screening panel grills are ideal as grilles in radiator covers, cabinet and door inserts, custom ventilation and screening for interior design.